I’m trying really very hard to keep my hands busy doing anything but snacking. Looks like knitting is filling the gap at the moment. This shawl took me a little over one week to knit. Granted, it’s not fancy but one week. A shawl. Me? Never happened before. I must really want that box of Four Cheese Cheez-its. Knit, purl, knit, purl. I might be paying the price for knitting-as-snack substitution, with finger numbness and an aching shoulder but I get a lovely prize at the end of it all. The silk merino wool blend I used blocks easily and drapes divinely. Instead of the left and right M1 called for in the pattern, I substituted yarn overs along the center and edges. I also took a cue from another Raveler with respect to the picot bind-off. The original pattern instructs you to knit a number of garter rows before doing the standard bind-off. Nothing wrong with that at all. I went all ooh-la-la when I saw this version though. About three garter rows, then the grinding task of “cable cast on 2 stitches, bind off 4.” I’m not sure how many stitches I had by the time I decided enough with the 12-row stockinette sections. What I can tell you it that it took me over 2 hours to complete the picot process. Hard work. Really hard work but not so much that I wouldn’t consider doing it again. Just not right now, okay? Another reason I’m seeing red is that February is American Heart Health month. The Go Red for Women campaign targets women with the latest recommendations for heart health. This year, updated guidelines rely less on dry clinical research and more on real-life situations and challenges. My father died as a result of heart disease. I’m making lifestyle changes that should go a long way toward keeping me around a bit longer. Go Red urges you to “Tell 5. Save Lives.” Consider this my due diligence. OOOH!!! I love this!! Must give this a try. I’m constantly making baby things for my newborn photography clients…but I think I’ll have to make one of these for me!! 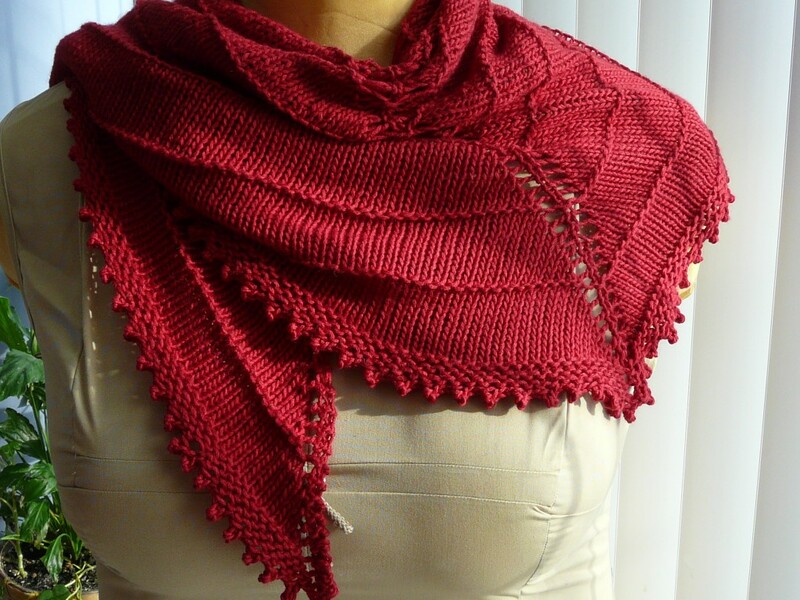 Your Boneyard shawl is just lovely – and the edging is gorgeous. You did a phenomenal job on it and I just know it will look beautiful on you. And good for you for thinking about your health and heart health! You are an inspiration – as I nibble on a piece of chocolate bar! And especially the reason for your knitting it! Go Red indeed…Wear Red – because heart disease doesn’t care what you wear…I’m glad you’re making heart healthy changes, ’cause we’d like you around quite a bit longer. Love that shawl. I think I need one!